A jar of Nutella is 400g. There you go. dV depends on vessel mass, as always. ..
Teasing: Jool and four of her moons visible in this shot. Somehow the space doors got closed while Jeb and Bob were on the surface, which I might not have noticed except that Jeb was unable to "call the ball" from this position per standard recovery procedure. So I switched over to Intrepid, got them open, and landed without issue. And that's why Bob looks so smug right now. Course already plotted for next moon, periapsis in 13 days. Which moon, you ask? OK, no one did. But here's the answer! Anyway, that was Chapter 12, hope you liked it, and an Interlude is next! So who will be tasked with grating the nutmeg? The best speed. Quite possibly the only speed available. The meep was so out of place i said it aloud and laughed at myself for 5 minutes before more laughter. Good wrap to a great chapter Kuzzter! Feature Helps Landing? Hurts Landing? Helps Takeoff? Hurts Takeoff? High Gravity Nope. Yes. Also, landings hurt! Nope. Yes. High TWR and dV required. Low Gravity Yes. No, though it might take a long time. Yes!! Not in the least. 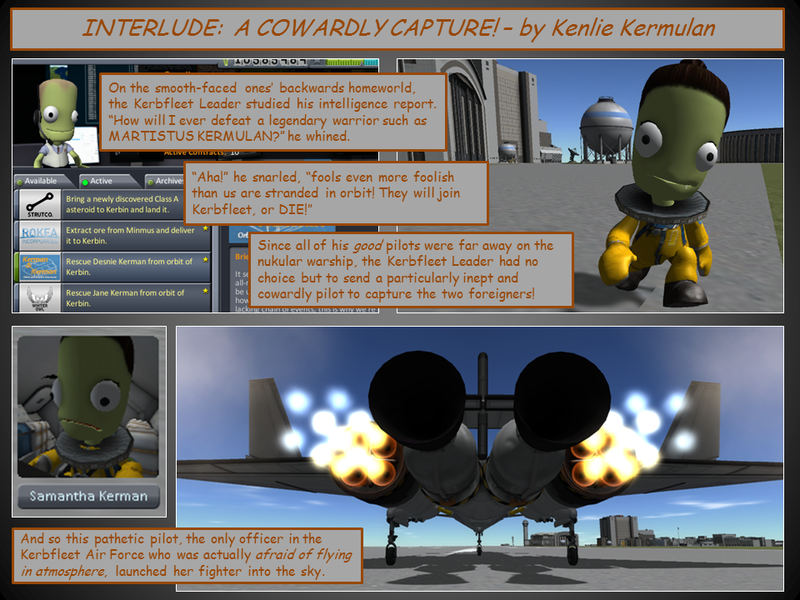 Normal Atmosphere Yes--drag and 'chutes Maybe, if heating not managed well Maybe, if wings. Yes--drag. Thick Atmosphere Yes--if you survive! Yes--heating must be managed No. DRAAAAAAG!!! 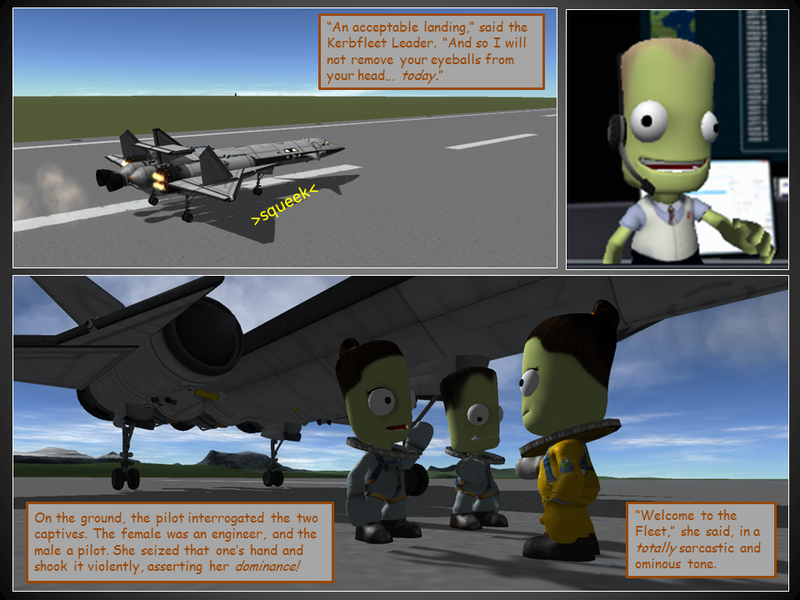 Tylo has high gravity, which is a pain for both landing and takeoff. 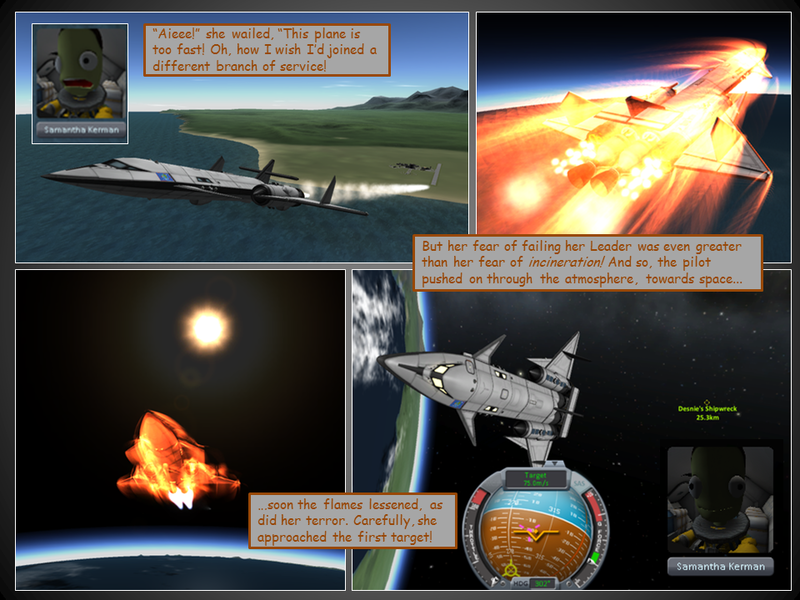 It has no atmosphere, which I think hurts you on landing a lot more than it it helps. 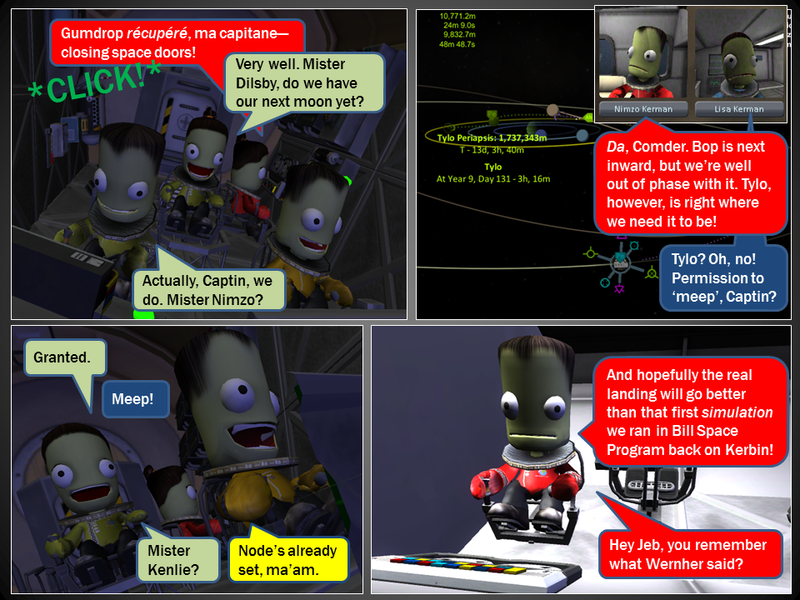 Think of Eve, or even Jool; it's really not that hard to design something that can survive to the surface of the former or the crush depth of the latter. 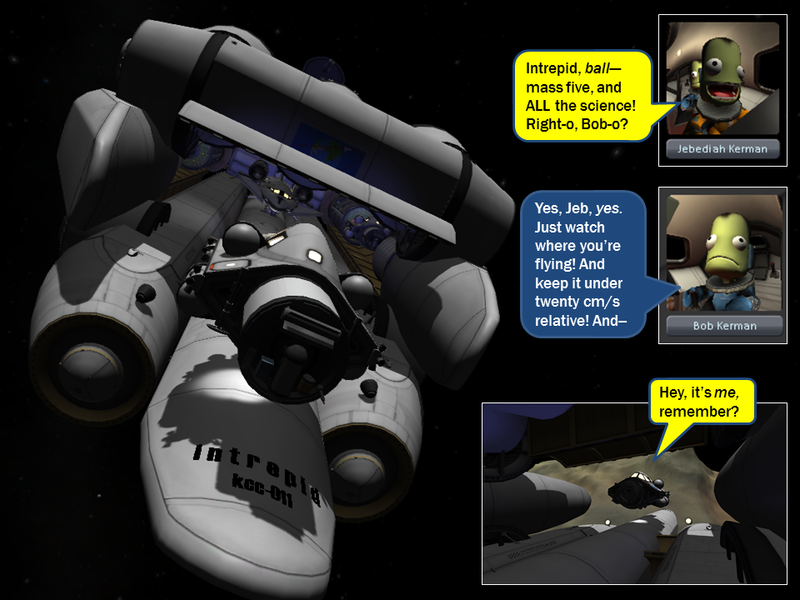 So, to paraphrase an oft repeated statement--you get stranded on Eve, you get killed on Tylo. Interlude teaser. Doesn't Sam look thrilled to be flying a Gliido instead of a Derpstar? Had to do a little maintenance as I had not launched a Gliido since 1.1. The small retractable landing gear are no longer suitable for a craft this size (30t on three wheels) so I had to upgrade to the medium gear. Fortunately the craft still looks cool with the bigger wheels, and you can't really tell from looking at my Euc3d model that it has the small ones. 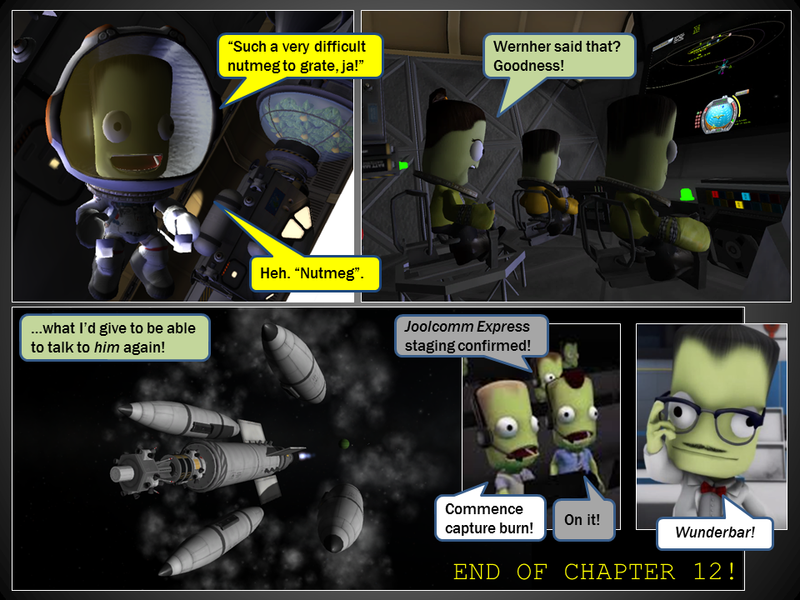 It occurs to me that A Jool Odyssey just might experience another disturbance in the persistence. 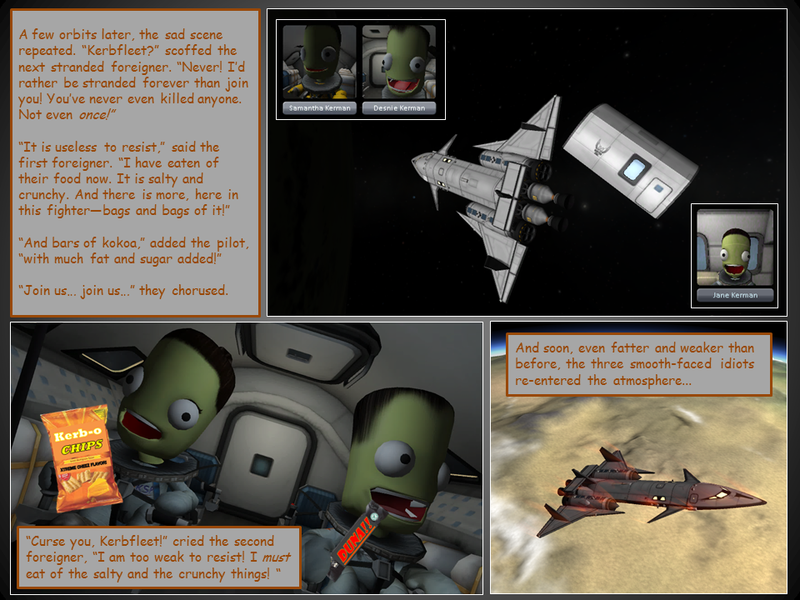 Would it be the first time an ongoing story has experienced two KSP upgrades? And two major ones at that. Certainly the first for one of my stories, or at least for one of my missions! Likely the mission will not be over when the next update drops, whenever that is. Depending on the timing, some hilarity could ensue. But of course I can't actually change over until all the crafts with their various mods work in the new version, we'll see. 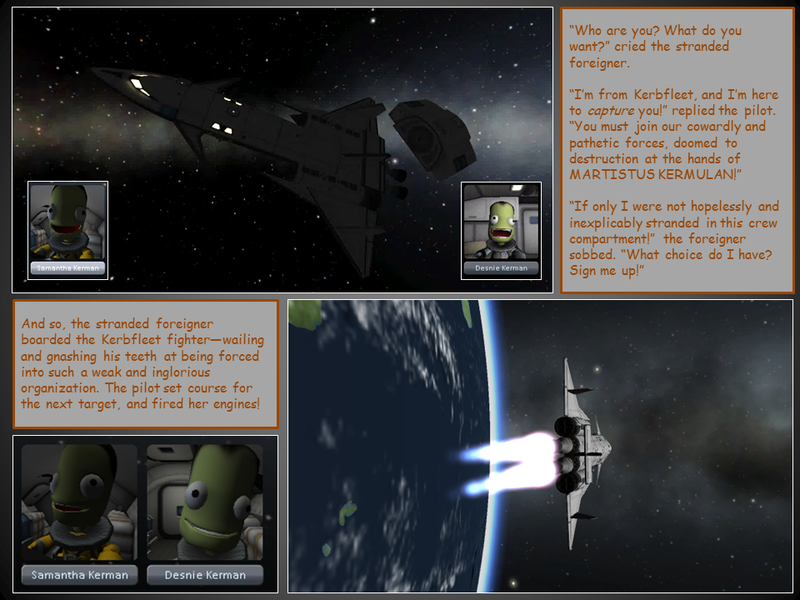 ...well this is strange, I'm trying to get a shot of a Kerbal on the ground walking towards the camera and can't do it. 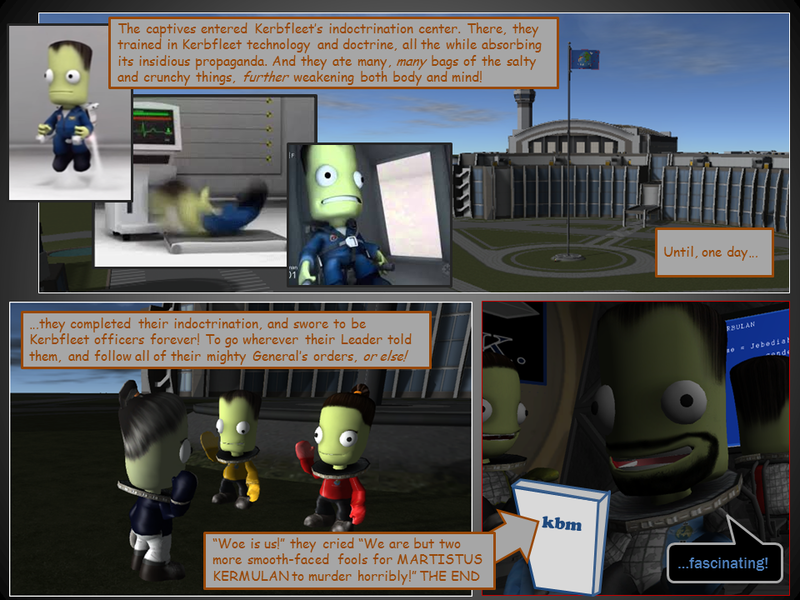 "W" makes the kerbal turn around and walk away, and "S" just makes her walk backwards. But I know I used to be able to do it because that's what I did for the shot of Tedus walking away from the crashed Dipperkraft. Did something change? I've run into this a couple times getting screenshots, especially if you're switching between walking and jet-packing a lot. 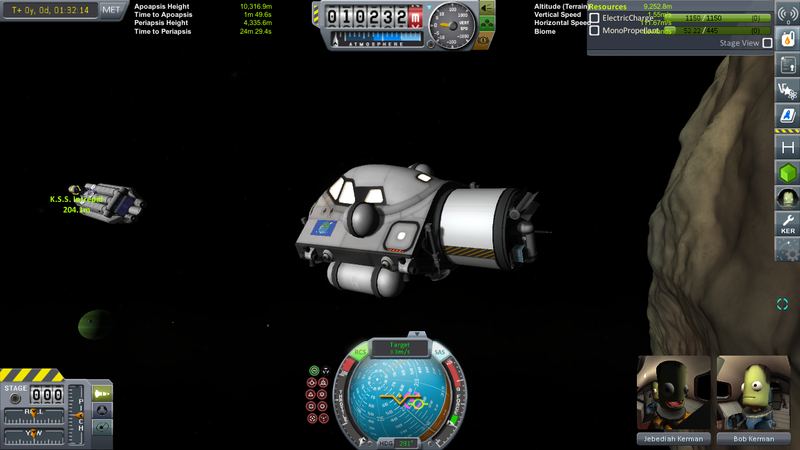 I just quit back to the KSC, then go back to where I left off and it seems to correct itself. 0] Ensure RCS pack is disabled. 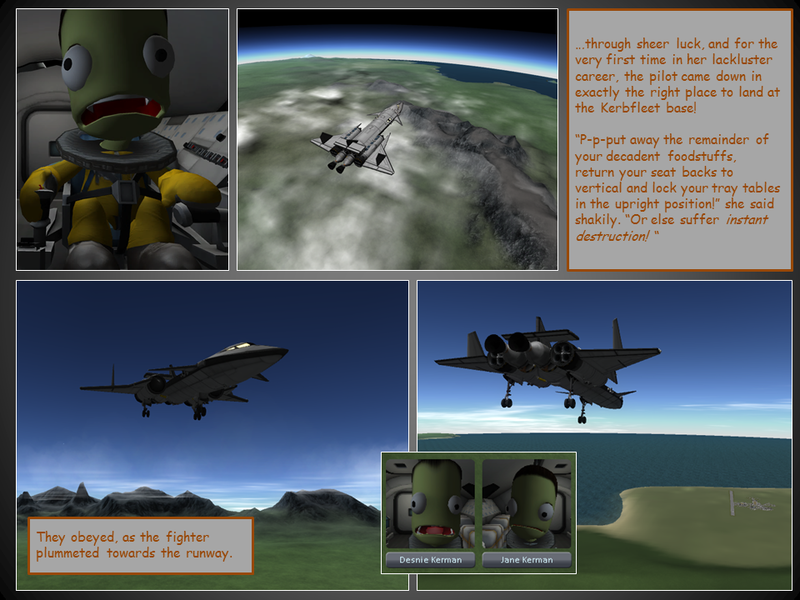 1] If disabled, re-enable, fly about a few seconds, then land and disable. Try Dramatic Walk again. 2] If still unsuccessful, the Space Kraken looms. 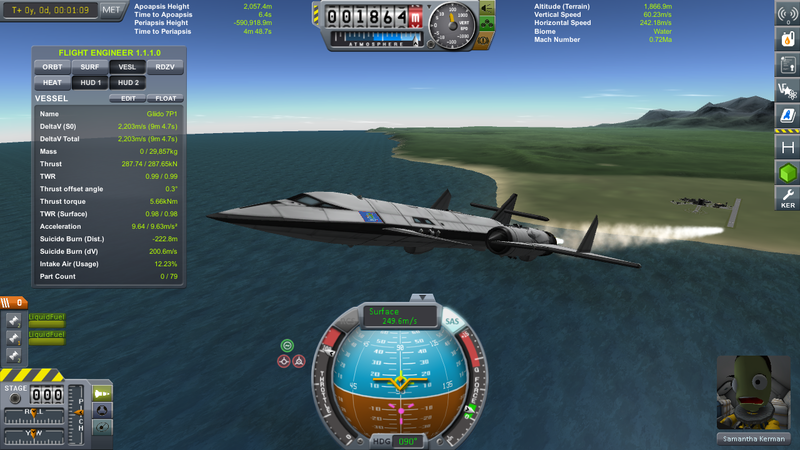 Return to KSC and re-load from there. 3] If problem persists, consult local priest/minister/rabbi/shaman/other. See about exorcism of Space Krakens. There's a key that toggles the walking mode from turning in the direction of walk to facing away from the camera. Don't remember which one, though. Was it ALT? or C? or... each time I accidentally hit that I get annoyed at it, too. And here it is... the whole darned thing at once even, no interruptions or commercial breaks! Fascinating indeed! And that last line sounds like someone who's concocting an evil scheme! Bob Kermulan concocts evil schemes with roughly the same frequency and intensity that our own Bob develops 'concerns', so I think you may be correct! Still wondering why the Kerbulan Empire uses army ranks instead of naval ranks?